Compress TIFF images to reduced size. Merge multiple TIFF images to one. Split multipage TIFF to separate pages. 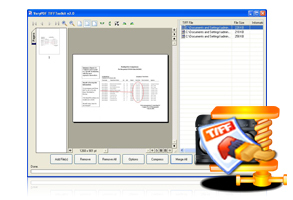 TIFF Toolkit is a useful application tool which can compress TIFF image files to small size ones, merge many TIFF image files to one combined TIFF image file or split one TIFF image with many pages to single ones. 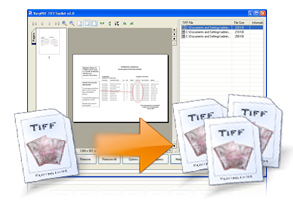 With TIFF Toolkit, the users can preview each TIFF image file added into the application which also allows users to zooming in or out the image. TIFF Toolkit also supports to preview the best fit size of image after zooming in or out. Merge multiple TIFF image pages to one single TIFF image file. Split multipage TIFF image to separate TIFF image pages. There are five kinds of compression methods in TIFF Toolkit, including LZW, Zip, PackBits, G3 and G4. You can use TIFF Toolkit to reduce the size of source TIFF files with anyone of the compression methods, which can help you store or transfer the compressed image files faster. If you don't want to browse, save or transfer many TIFF images one by one, please use TIFF Toolkit to merge these multiple TIFF images to a combined one. Just by some easy clicks, the application can realize this function in a short while. TIFF Toolkit has the ability to split multipage TIFF image files to separate pages for those who need this function. The application also allows you to storing the separated TIFF images in a newly created folder. 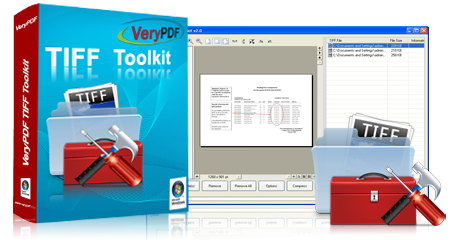 Convert scanned PDF to editable Word or RTF documents in batches. Split multipage TIFF to single page TIFF in batches. Compress TIFF files with LZW, ZIP, PackBits, G3, G4 compression methods in batches. Show the page number of a multipage TIFF file. Able to rename output TIFF image files automatically. View TIFF thumbnails by a preview window. Able to rotate the thumbnails when previewing them. Right click to get the detailed information of TIFF. Contain some TIFF command line utilities. These command line applications can be called from a script or web application to process TIFF files in batches. Extract images from PDF to TIFF format. 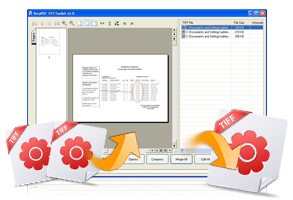 This application is able to create multipage TIFF images without opening the PDF by a PDF reader.